Today is the day! The Quiltmaker's 100 Blocks vol. 7 blog hop kicks off today. I didn't design a block for Vol. 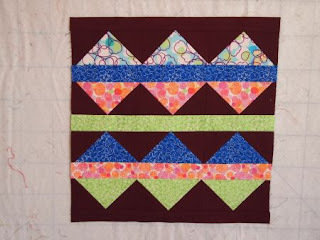 7, but I did test a passel of the blocks, and design and piece a sample quilt. Below are the blocks I tested. 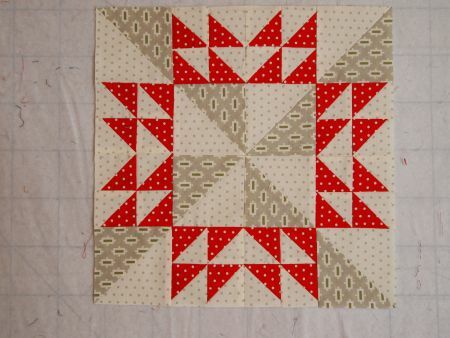 I enjoyed test-sewing the blocks. It's amazing how creative block designers can be! 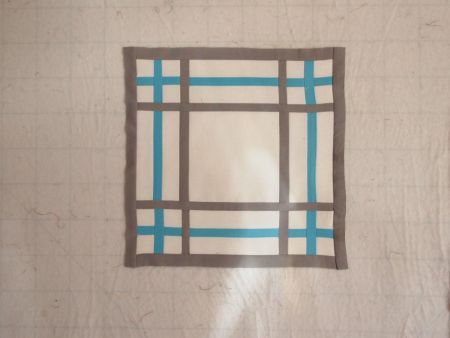 My favorite part of the process was designing a quilt using one of the blocks I tested. I particularly wanted to sew a "modern" quilt. At the time my quilt was due, I had only tested one block that I considered truly a "modern quilt" block, "A Divided Flock," by Elizabeth Dackson. Testers were urged to used three or more blocks that they had sewn, but I couldn't find another block that went well with Elizabeth's block. So I used just the one, repeated twelve times! Since I wasn't "following the rules," I called my quilt "Flying My Own Way." It was a thrill for me to use a fabric line that had not yet been released, Denyse Schmidt's "Shelburne Falls" collection. Quiltmaker magazine presents each block tester with two copies of the new magazine, and I'd love to give you one of my copies. If you'd like one of the test blocks sewn by Your Aunt Marti, as well as the magazine, just leave a comment on this post before next Monday, May 6 at noon MDT. I'll let the Random Number Generator choose a winner -- yes, international entries welcome! Tomorrow is the last day to send me the photo of your April UFO -- I got mine done, wheeee! Come back Wednesday to see the Parade. Wow, you tested a lot of blocks! I always love these magazines because they are full of new ideas and inspiration. I'd love to win the magazine and a block. Although it's hard to choose a favorite block, I'll pick Barn Swallows. They are all lovely...ehat a lot of work! I think batn swallows is my fave. Thank you! Estas revistas eu não encontro aqui no BRASIL então gostaria de ganhar.Obrigada. Love all of your blocks, but the Barn Swallows is my favorite! LOVELY! You are so creative. My favorite block of the ones you tested was rick rack. It's very unique. Thanks for the chance to win! Beautiful blocks! I'm still working on my April UFO... hoping for a last minute finish! I like your quilt very much. I find it hard to follow rules or others' patterns-inspiration sure, but copying someone else's stuff seems counter-intuitive to me. YMMV of course. They all look great! My fav are barn swallows and rick rack. 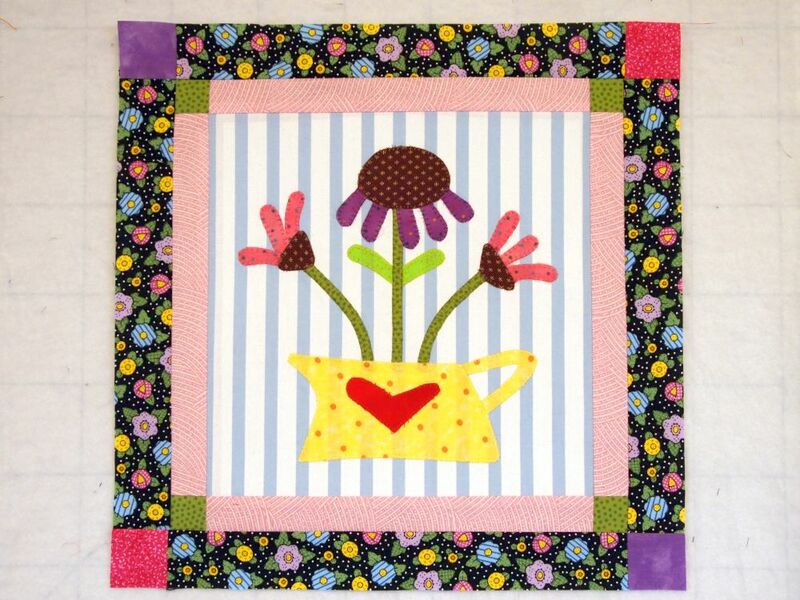 What a beautiful flock on your quilt! The apple tree is my favorite! Love it! Love the divided flock - such a clever name - but particularly love Barn Swallows and I have a weak spot for what we call Beach Houses - aka Beach Cabanas . . .that testing sewing would have been a lot of fun and I go with the "patterns are made as a guide", so interpretation is part of the plan. 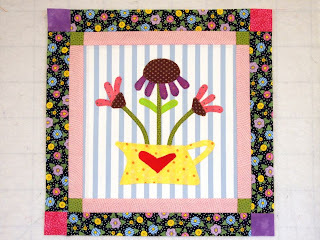 and meant to add - love the title of your quilt too!!! love word play. Know you have such fun bein' a Tester! How exciting!! Cool magazine!!! We don't gtet those in the magazine shops here in the UK so of course I would love to win!!!! 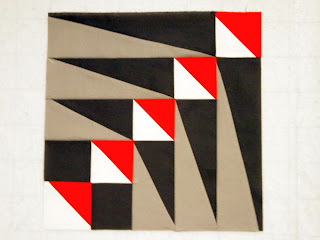 I love what you did with the modern block...ofc I love anything Denyse Schmidt so I might have liked it no matter what you did! Very nice! Barn Swallows is gorgeous, and I also like the Hearts Around block too. It certainly looks like you had some fun making up these blocks. I hope I get to join in your fun!!! I LOVE Barn Swallows - especially in those bold colors - it's so dynamic (or should I say aerodynamic! 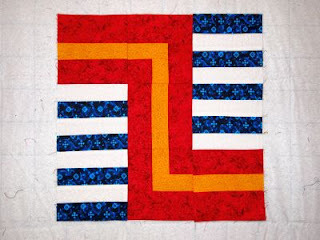 Don't care if you didn't follow the rules - your one-block quilt is beautiful! Thank you for the chance to win the 100 Blocks magazine. 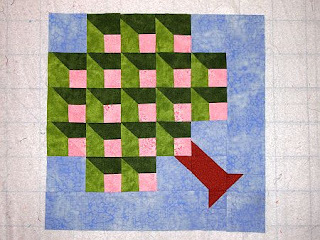 I really like the way you used the Divided Flock block. That is my favorite or Apple Tree or Plaid (I am always fascinated the way a plaid pattern can be pieced) OR Rick Rack OR? There are simply too many to decide! Irene, I must confess that Plaid block about did me in. I had the hardest time making it come out the right size, although it looks very cool when finished! Wow - you've been busy Marti! I love the 'barn swallows' block! Wow! That's a lot of blocks. 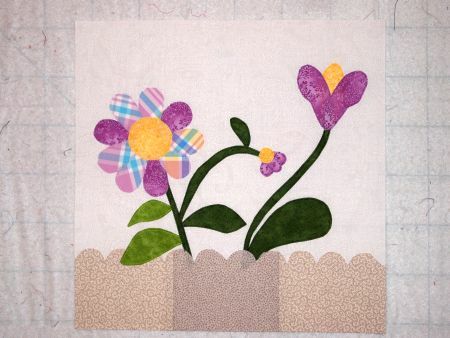 Are you going to make the rest of them into a sampler quilt? That "Barn Swallows" block is so striking. But I also really like the "Hearts Around" block. I could see myself making a whole quilt from that one. 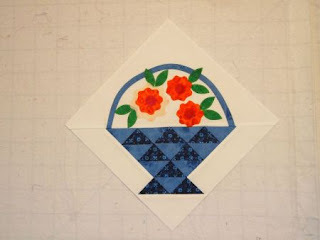 Truly some lovely and fun blocks, I'd say my two favorites are the Barn Swallows and Prairie Sunburst, but am also intrigued by Apple Tree, Rick Rack Row and Hearts Around and Stairway to Heaven is also interesting. I love the Rickrack! but they are ALL gorgeous! The barn swallows is too cool too! I think I better send you an email! Awwwww! 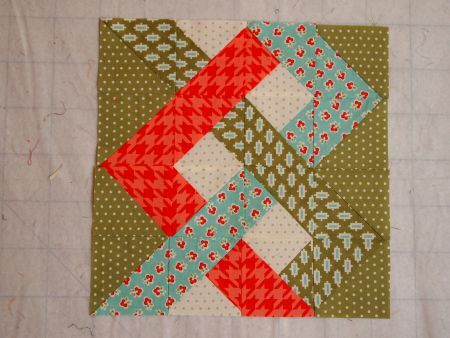 I love the way you did my Summer's End block. Do you mind if I show it on my blog, too? Have a super day! Love to get my hand on a copy of that magazine. Thanks for the chance to win one! The Prairie Sunburst block is beautiful. I like the barn swallow one. 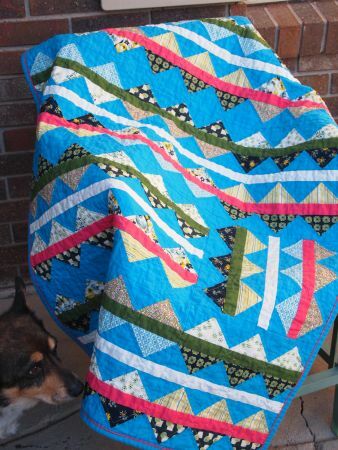 I have an idea for a fabric bundle in my stash that it would work well with... thanks for sharing! The barn swallows is pretty cool and so was the prarie sunburst! I also love the bright blue that you use in the quilt! Which one was your favorite? Prairie Sunburst is my favorite. Thanks for the chance to win! You did a great job with those blocks. I'd love to own a block made by Aunt Marti! And, to win the magazine, too. Thanks! Love the barn swallows block! I love Rick Rack Row - I can just see that made up in three colours on all white or black. What a busy girl you are!